Chicago officials should focus on adequately funding support for victims of homelessness, rather than concocting ploys to purge them from the public view, advocates said Tuesday, after a Cook County judge permitted the city to clear out viaducts used as shelter by homeless people under the guise of improving infrastructure. On Friday, Cook County Circuit Court Judge Celia Gamrath dismissed a lawsuit arguing the city had unlawfully discriminated against homeless people in 2017 when it redesigned the sidewalks under two viaducts in the Uptown neighborhood in order to prevent them from sleeping there. The city demolished the encampments purportedly so it could convert the sidewalk space where they resided into bike lanes – a quest that deviated from its own conventions for transportation planning. Compared to the 10 U.S. cities with the largest homeless counts, Chicago ranks last on a per-capita basis in the amount of aid that it allocates to people deprived of permanent housing – and yet Mayor Rahm Emanuel’s administration opposed a recent bid to supplement funding that would curb the city’s homeless population by more than 35,000 in 10 years. 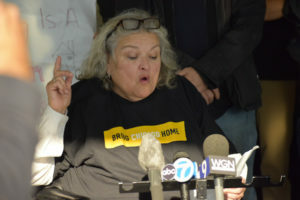 Championed by the Bring Chicago Home campaign, the measure would have authorized a ballot referendum asking voters if the City should increase funding to alleviate homelessness by raising the one-time real estate transfer tax on the sale of properties worth more than $1 million. Nearly 95 percent of all city property transactions would be exempt from the tax. Despite the support of 33 Alderman and a public opinion poll showing that two-thirds of likely city voters embrace the funding concept, the proposal did not advance in City Council after Emanuel voiced his dissent. After the original proposal to put the question on the ballot in February failed to pass, a new resolution was introduced in December and is now pending in the finance committee. CCH Law Project client Carol Aldape speaking at a December 2018 press conference. Meanwhile, the city continues to spend money to legally defend its practice of forcibly dislodging homeless people from public property. 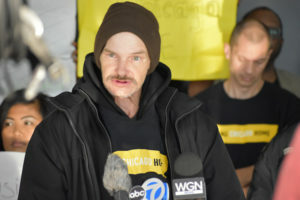 Chicago Coalition for the Homeless (CCH) has filed three lawsuits in the past four years charging that that these tactics are unlawfully discriminatory, with Friday’s ruling representing the only case among them that was dismissed. In Uptown, the City razed homeless encampments under the Lake Shore Drive overpasses at Lawrence and Wilson Avenues in September 2017, after it formulated a plan to supplant sidewalk space with new bike lanes, even though it has a policy of placing bike lanes in the street. The move was widely decried by those who lived under the viaducts and advocates for the homeless as a transparent pretense to prevent homeless people from taking shelter there. Two people who lived under the viaducts filed a lawsuit charging that these actions violated their rights as individuals experiencing homelessness, under Illinois law. CCH Law Project client Tom Gordon speaking at a December 2018 press conference. “The newly constructed bike lanes are a clear example of how Chicago discriminates against people like me and refuses to create real change to help people experiencing homelessness,” said Tom Gordon, one of the two plaintiffs in the lawsuit. The plaintiffs are represented by the Law Project of the Chicago Coalition for the Homeless, Uptown People’s Law Center, and Butler Rubin Saltarelli & Boyd, LLP. Later this week, the city is scheduled to conduct its annual census of its residents experiencing homelessness, using an approach that invariably understates the actual magnitude of the problem by a staggering margin, advocates say. The city’s official tally only accounts for homeless victims who occupy shelters or are observed on the street during one night of the year. It excludes, however, the much more prolific number of homeless children and adults who are living in “doubled-up” conditions, where they squeeze into overcrowded housing shared by two or more households. For instance, Chicago Public Schools identified more than 15,000 of its students who were homeless and doubled-up in 2017, but those children were not included in the city’s estimate of its homeless population. In fact, publicly reported data shows that doubled-up households comprise a bigger share of Chicago’s homeless population than in any of the other 10 U.S. cities with the largest homeless counts. Chicago Coalition for the Homeless estimates the city’s actual homeless population surpasses 80,000.